Most soil types, but best in moisture retentive soil with some compost dug in. Tolerates light frost, but needs protection from hard freezes. Garlic, Beet, Dill, Chives, Basil, Carrot, Strawberry, Radish, Spinach, Lettuce, Cabbage, Scallions, Onion, Onions and Poached Egg Plant. Start seeds indoors in early spring, or simply sow fresh seeds where you want them to grow. Scatter seeds atop prepared soil, about one-half inch apart, and barely cover them before patting them into place. Sow more seeds in summer for a fall crop. As lettuce seedlings grow, thin them so that the leaves of adjoining plants do not overlap. Mulch open space between plants to retain soil moisture and prevent weeds. 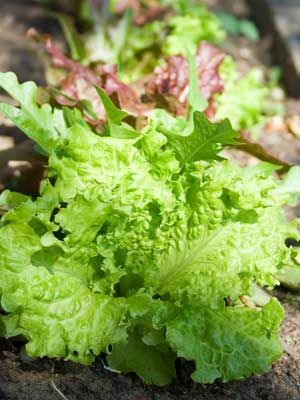 You can pick individual leaves, use scissor or a knife to harvest handfuls of baby lettuce, or grow plants at proper spacing to get large, loose heads.